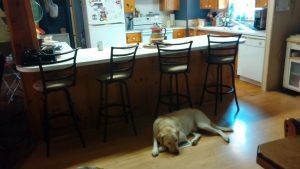 Custom Wood Countertops On A Budget! Countertops no one else has! So I mentioned in my About Me page that I inherited my Mom’s house. My Dad was not crazy about moving into an old double wide when they bought this place. The only reason he did, was to make my Mom happy. (Awwwwe) I know, my Daddy is a sweetheart. I don’t think I ever heard him tell my Mom no in the whole 43 years they had together. He went above and beyond “Happy wife, happy life”. 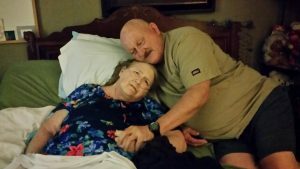 This is the last picture taken of my Mom and Dad. She woke up that morning and told him “Give me a scrunch baby.” It was so stinken cute I had to take this picture. So what was it about this place that made my Mom want it? One, it was outside of the city in a literal valley. Like seriously, the name of our road is Stillman Valley. It is down a private drive, surrounded by beautiful Texas countryside. Second, was the kitchen. Now I am not quite to the whole kitchen reveal point yet, but let me just give you a few old pictures I found so you can get the idea. Mom loved that horrid blue wallpaper (turned out it was just contact paper that the owner slapped on the walls to hide some shoddy work he did), which is covered in white polka dots that you can’t quite make out in the picture, those glaring white laminate countertops, the sink looking out over the back yard, and that huge island. We were military, enlisted military at that. What that meant was that we always lived in military housing. I promise you there are no islands in military housing. But she stood by my Dad all of his military career, so when he retired, she got her island! I love the island too, don’t get me wrong. 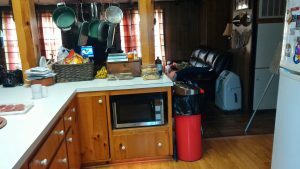 I have more than enough prep space when I cook, it is wired up for electrical, so I can use my mixer, skillet, crock pot, instapot, rice pot….you get the point. 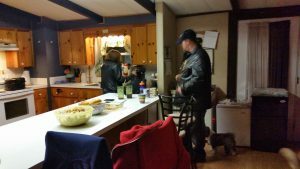 But I hate Hate HATE white counters….appliances…. I just don’t like white in my kitchen. But my silly behind went and painted my cabinets white and picked a white sink!! Yeah, yeah…. I know I am crazy! Anyways!! I also am not a fan of laminate counters. There was no way in the world I was going to be able to afford a stone countertop, so I thought butcher block. I went to Lowes, Home Depot, IKEA….yeah the price was nuts! I have a lot of counter space people. So then I took to Pinterest and came across this post from The Rozy Home, featured by HomeTalk. I fell in love with the idea, but I had a different vision in mind. I wanted something unique if I was going to DIY this, so I mulled it over for a few days, priced out some wood and other supplies and for right around $90.00, I got my custom wood countertops. I promise you no one else has them like this, because I choose to believe I am just that awesome! Not a lot of pictures, but hang in there and I will explain…. Now this happened right at the beginning of my remodel before I decided I was going to be a blogger, furniture re mixer, or anything else. If you had told me two years ago I would have done everything I have done, let alone that I would be blogging about it, I would have told you that you were a few french fries short of a happy meal! 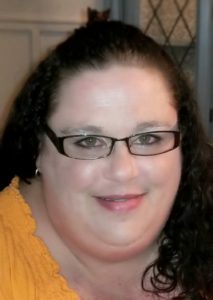 I was proud of it and amazed myself, so I took a few “yay me pics”, so we do have those. I did not know any of this information then mind you, but I called the wood working expert, aka my Dad and he says we can make it work. I will tell you now, my Dad never showed up to help me, but it’s ok. We still love him and he is still my most favorite person on the planet. So furring boards come in three sizes at my local store, 1 x 2, 1 x 3, and 1 x 4. I got 25 of the 1 x 3 at $1.86 a board, and 15 of the 1 x 2 at $0.96 a board. 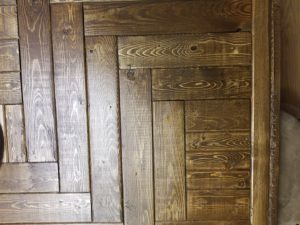 Whether it is furring strip boards or a high dollar board, be sure to use a wall or post to check that the board is straight on all sides and that there aren’t any huge chunks or chips missing from it. Pick through the boards and find the best of the best! I also grabbed a big bottle of wood glue. Had my Dad not been a sweetheart and bought me a brad nailer with 3 boxes of nails and a sander with an assortment of 160 sheets of sandpaper I would have had to buy those too…or just nails to mount the boards to the counter after I glued them down. I went ahead and got my stain, just a tiny can was plenty for all of my counters, pre-stain wood conditioner, a tub of DAP plastic wood filler, and I got Wipe On Polyurethane in Satin. First, I started by using a heat gun, which Dad left in the garage, to start heating the edge pieces of the laminate so I could lift it off. Once I got a rhythm going it was fairly easy. I will tell you, this isn’t a quick process. Go slow and steady and you will have a much easier time getting a clean result that doesn’t require a ton of clean up work. After all the edges were off, I started at one corner of the counter and started on the tops. It took about an hour to get all the laminate off. Then I got my sander with a 60 grit sheet. I grabbed about 8 sheets, and this is not how many I needed but I will explain why later in the post. I used the sander and sanded about a 2 by 3 foot area at a time and then changed sheets to get the glue up. I then went over it with a rag with mineral spirits on it, and then with just regular soap and water twice. People asked all the time why bother with all of that if you are just covering it right back up with glue and wood? Well the adhesion is better with a new adhesive on a clean surface, and you want to make sure your boards can sit level. Once this was done, I measured the outside edge of all of my counters around the perimeter. On the counters by the stove and sink it was just a simple length measure, but the island was going to be my show stopper, so I had to miter the corners and my island has an L shape, so this took some concentration. Just remember, inside corners point down, outside corners point up, the point being the longest part of the cut. I didn’t learn this until we were hanging crown molding a year and a half later and it would have saved a lot of wood had I known. So I made all of my cuts on the 1 x 3. I took the smallest part of the counter first and had my nephew hold the board on the edge of the counter while I laid a small piece of the same board on the counter. I wanted my counter to be like an inlay. Once I knew the height was right we started nailing it to the old countertop framing. BE SURE TO USE YOUR LEVEL THROUGHOUT THIS PROCESS! I didn’t at first and ended up having to pull a bunch of boards off, pound out the nails, and then reattach them. Once the framing was up, I had a general idea in my head how I wanted to do this, but wasn’t 100% confident I could pull it off. I thought it would be better to frame the island out in sections with the 1 x 2 boards. I did this by doing the L part of the counter as one frame, framing out an inset for my new countertop pantry that I made out of an armiore and recessed into two posts on that end of the island (that is a separate post that I will reference back later). and then splitting the distance of the now true island. I marked the middle of the counter off and the middle of the 1 x 2 I had cut to fit in the frame. I nailed this one in and one on each side, and nailed the other framing in too. I also framed out the counters on either side of the stove and both sides of the sink to make sure everything matched. I started with an L in each corner and just worked in from there. I can tell you I ran in and out of the house at least 100 times on each section because after the first three L’s in each corner, I had to start cutting custom sizes. I ended up with these cool little squares in each section and I just did three 1 x 2 pieces to fill them in. The pattern is truly custom! This is immediately after of the whole counter, after stain, and a current picture of the little boxes I filled in on each section. Now that I had everything perfect in the frame, I put glue on each individual piece. This took close two hours. It was 3 a.m. and I was beat, so I went to bed. My nephew got up to go to school at 6 a.m. and came and woke me up because he was amazed at how awesome it looked! I guess all I needed was a cat nap, because I was back at it as soon as he was out of the door! The next part was super easy. I just popped two to four nails in each board with the nail gun. I think I was done in 20 minutes. I knew the next part would take forever, and my nephew wanted to help me with it, so I went to back to bed and slept like the dead until he got home from school. Next was the wood filler part. Every nail hole, every groove, every crevice. It took about 4 hours to do this! I love the uniqueness of my counters….but good Lord, I did not like this part at ALL! The woodworkers are saying “that’s why you shouldn’t have used furring strip boards!! Ha Ha Ha. I was done and dirty after all the wood fill. I took a nice hot shower and got a good nights rest. It was time to sand my counters. I always start with my corners. You can see here I just round around the edges so no one cuts themselves if they bump into them, and it helps them look rustic and weathered. Now you remember earlier I said I would explain the sand paper? This is my little hack. 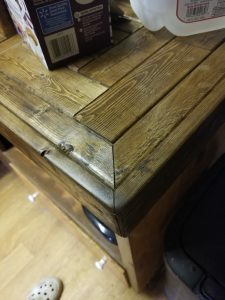 I learned from sanding my cabinets before cleaning them, that you pick up everything on the sandpaper and it stays there unless you flake it off. I left it. I wanted my counters distressed, but didn’t want to beat them with chains, or hammers, or screws or anything else. A rougher grit sandpaper with some buildup on it, gives you the same effect. I have a drawer of 60 grit paper with buildup on it just for this reason. It looks totally like I worked really hard to distress these, but I promise I didn’t. All I did was sand them. After I sanded with the 60 grit, I jumped right to 120 grit, then to 240 grit. 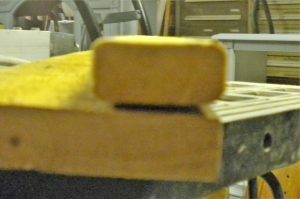 Your first grit is your longest sanding, after that it is cake. Bust out the shop vac (or house vac works too) and clean up all the saw dust. Then wipe them down. Shake up your pre-stain wood conditioner. I always use this on pine or cedar because they can get blotchy. 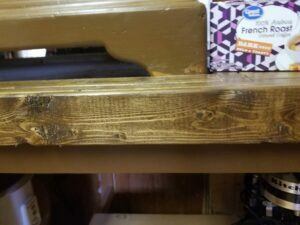 Soft woods take stain differently, so if you don’t want dark and light spots always pre-stain. I should mention here to be sure to open the windows because it gets funky. After that, I gloved up and got a t-shirt and wiped my dark walnut stain into the wood. After the first coat I was happy with the way it looked. I took a clean t-shirt rag and went over everything one more time and then let everything sit for about an hour. It was time to seal. Now some people worry about the poly on a food surface. As long as you wait at least 48 hours, and then clean it very well with soapy water, I have never had any problems. The not food safe part is a drying agent that evaporates as it dries. Your counters have to cure anyway, so you can’t use them. 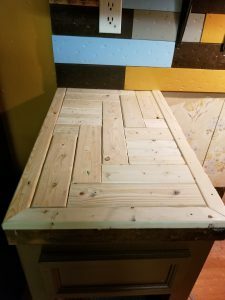 They do have a product called Tung oil, which you have to apply monthly, or you can use Zinnser Bulls Eye Universal Sanding Sealer, which is a shellac and is also food safe if it is that much of a concern. I like the wipe on poly because it is super easy to apply, and it gives your wood a rubbed finish. I like that it comes in satin because I have never seen a shiny piece of natural wood which is what the rustic look is all about. So I wiped on a coat of poly, waited an hour, lightly sanded with 240 grit sandpaper, and repeated 4 times. It has been two years and no damage, and they are still water tight. I use Orange Glo on my counters once a month and it keeps them oiled and beautiful. They are still my favorite part of my kitchen. So get out there and explore. Make your own one of a kind, show stopping counters and be sure to share them in the comments below as well as any questions or comments about this post. Loving this page and content love the details and how deeply you’ve dived into the content backing it up with facts and showing how it works this is great! Thanks Jamaar! It’s easy to dive in when you love what you are doing! i really enjoyed your post. You gave great detail, yet made it personal. It was more like reading a story than a “how-to”. Your final product looks amazing, and you made it seem not too difficult that maybe I could try to do it too. Thank you for sharing! Hi Joanne. Thank you for your feedback. You could definitely pull it off! Thank you Brandon! Don’t forget to use “gunked” up sand paper to get that rustic look if that is what you are going for! 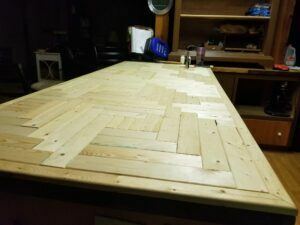 This is great article, you gone into so much detail on how to custom your worktops, mine are in a desperate state and i was going to replace them, but after reading your article i think i will give it a go myself, with a little help from son inlaw, who is a carpenter. I will be showing him this article tonight. Keep adding these great ideas. Thanks Chris! It’s so easy and such a great alternative to stone if you can’t afford it or if you just want the warmth of the wood. Good luck with your counters! Let me know how they turn out. I think what you did with the kitchen tops is a great job which reminds me that our kitchen is well overdue for a complete refit. I like how you have gone into great detail and shown us the process from start to finish and just goes to show with a little ingenuity what anybody can do. If I had a choice then wood for me would always win hands down, but here in the UK, that is a very expensive route. Thanks for sharing, I really enjoyed it. Thanks Jo! I will try not to disappoint! Tina, this is really impressive. I love the look and the article almost makes me think I could do this. Ha. I appreciate your humor, as well. This was a terrific article. Somehow you spun your personal life with the art of furniture restoration to your liking and specifications. My wife and I just went through a remodel, and we had a dining room set hand-crafted by artisan Mormons in the midwest. My wife had a certain style in mind, and after three months they delivered a set that was so gorgeous that when my wife say it she cried with joy. Great piece! Wow! this is fantastic. I have been contemplating doing some custom woodwork but I wasn’t entirely sure how I was going to do the top. Your L pattern looks great after it is all put together. 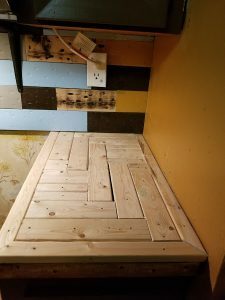 What I want to build is pretty much similar to what you are doing but instead of being a countertop for inside the house I was looking to build a bar for the backyard. Which I think this top would look fantastic on. 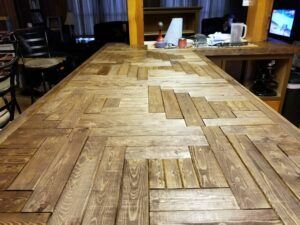 Do you have any articles on building a bar? It would be awesome to find a good way to start. Thanks for this! I haven’t tackled building my bar yet….but I have been researching it in contemplation. I plan to start with a kitchen island and some corrugated tin. Just a jumping off point for you. Thank you for the feedback and let me know how the bar turns out!